Contrast panel, sleeveless dress featuring surplice bodice and yoke waist. The A-line skirt has shirred waist with side pockets. Fully lined. Very limited edition. True style is timeless. Every decade always adds something new to the fashion scene. Some good and some we may care not to remember. With our new release, The Sinclair, we look back to the 1960s & 1970s to create a 2018 essential. We started with a vintage 1970's bisected dress to serve as the canvas for our take on the 1960's Mondrian-inspired fashion trend. 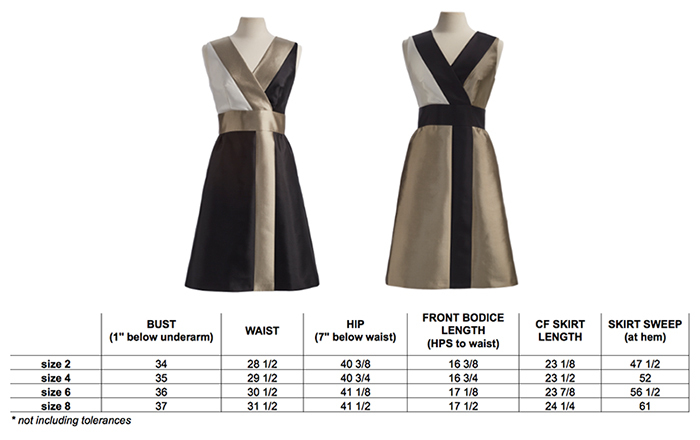 The fully lined, sleeveless dress features three color contrast (black, champagne and cream) paneling with a surplice bodice and yoke waist. The A-line skirt has a shirred waist with side pockets. Knowing that schedules, calendars and closets don't always align, we designed The Sinclair to be the perfect go-to for both day or evening living. Very limited edition.